Digital media companies like Vice Media, Vox Media and BuzzFeed wowed investors with their large, young audiences and original content generation. These three companies plus digital publisher Mashable, which sold to Ziff Davis in 2017, have cumulatively raised over $2 billion since inception. Vice Media, one of the most closely watched digital media companies, was able to raise $1.4 billion from notable strategic investors including The Walt Disney Company, A+E Networks and 21st Century Fox. 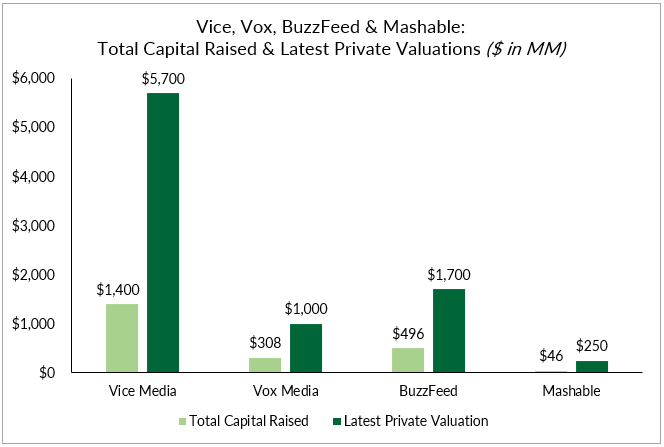 Similarly, Vox Media and BuzzFeed raised approximately $300 million and $500 million, respectively, from media giants like NBCUniversal and seasoned venture capital investors including Andreessen Horowitz, Khosla Ventures and General Atlantic. While raising hundreds of millions of dollars, these companies also attained billion dollar plus valuations, with Vice Media reaching a valuation of $5.7 billion. Before its sale, even Mashable was reportedly valued at $250 million after raising money from Turner Broadcasting and Time Warner Investments. However, Mashable’s heavily discounted price tag of $50 million in its sale to Ziff Davis was a sign of things to come. In general, digital media companies have stagnated if not struggled throughout the last year or two. Vice Media notably missed its 2017 revenue targets by $100 million and is reportedly shedding 10% to 15% of its workforce as it’s on track to miss 2018 revenue goals as well. Vox Media similarly is expected to miss its revenue target by over 15% after laying off approximately 50 employees (or 5% of its workforce) earlier this year. BuzzFeed has not been immune to the digital media woes either, after reportedly missing its revenue target for 2017 amid a business restructuring that has led to over 100 layoffs. Digital publishers have found it difficult to compete for digital advertising dollars in the U.S. market, where Google and Facebook together account for over 60% of spending and nearly all of the market’s growth. For companies that built their businesses on advertising content, like BuzzFeed, the Google and Facebook duopoly has forced them to diversify revenue streams. Moreover, concerns over the advertising market have been increased by changes to Facebook’s news feed algorithm, which “will no longer prioritise news sources and will survey its users to rank publications by their ‘trustworthiness.’” BuzzFeed and Vox Media both use the social network to distribute their content. The rise of streaming services from Netflix and Amazon has also contributed to the woes of these once-hot companies. Notably, Vice Media missed its 2017 revenue target due to weaknesses at its Viceland cable channel and digital video operation, indicating that Netflix and Amazon are not only putting traditional media, such as television, under immense pressure. With streaming services on the rise and the Google-Facebook digital advertising duopoly set to continue, these digital media companies may continue to struggle for the foreseeable future.